A bit late because I didn’t feel like recapping so much. Better late than never. The following morning, we woke up bright and early to begin another day of exploration. While Timmy and I made our way past the front gate, Omar and Katy checked out of the hotel. Once we were all outside, Omar informed us that to book the hotel for another night would cost an additional ¥4000. For some inexplicable reason, we decided that the extra ¥1000 contribution from each of us was far too steep a price to pay, so we declined to book the room again; a decision which would cause us much frustration later in the day. The first stop of the day was Oasis 21 and Nagoya Tower, about a 15 minute walk from our hotel. 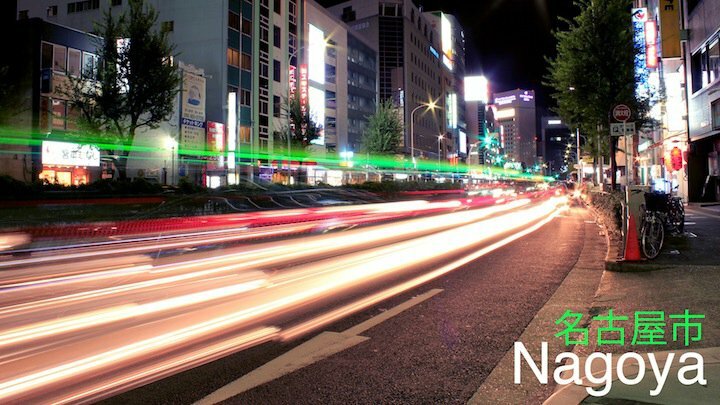 Oasis 21 and Nagoya Tower are in the center of Sakae; one of the main entertainment districts of Nagoya. 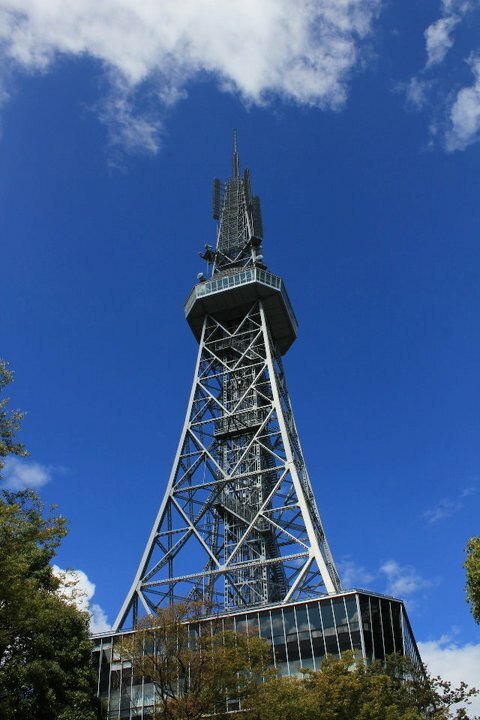 Nagoya Tower was completed in 1954 and was the first TV tower ever built in Japan. Standing 180 meters tall, it is one of the highest structures in Nagoya. 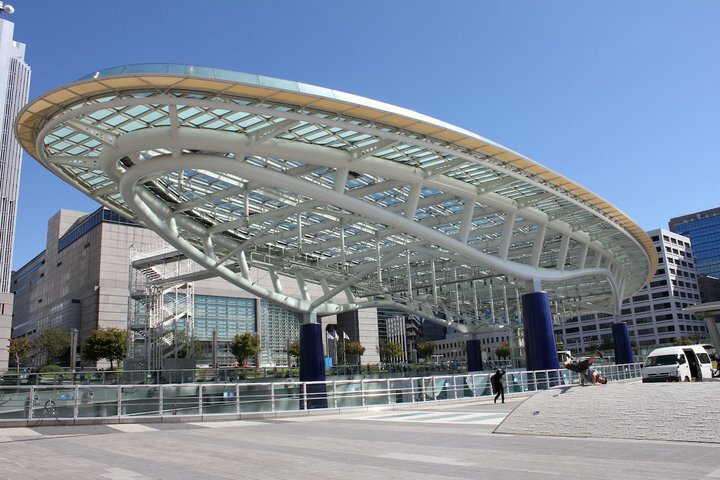 Right beside Nagoya Tower sits Sakae’s new landmark – the futuristic looking Oasis 21 complex, which was opened to the public in 2002. At the top of this interesting building is a walkway that contains pools with large pink inflated monsters. 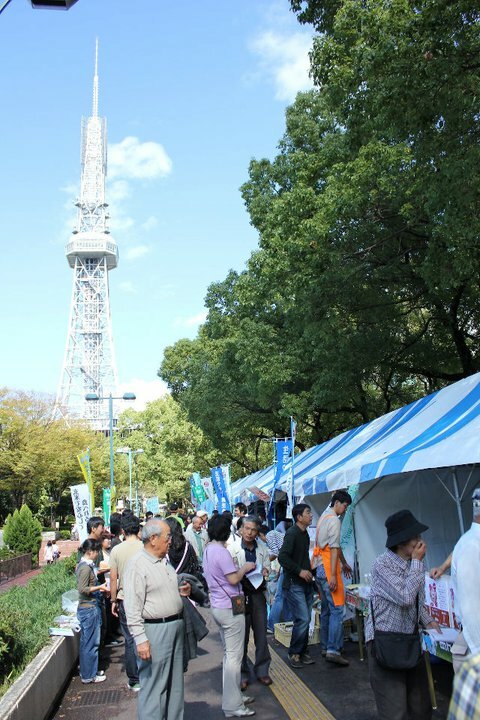 In betwen Nagoya Tower and Oasis 21 was a park/community area where a small fundraising event was being held. It seemed to be promoting eco-friendly living and local agricultural businesses, but due to our limited Japanese, we weren`t really sure. After snapping some pictures in and around Nagoya Tower, Oasis 21, and the local event, we walked across the street to a hole in the wall Ramen shop. 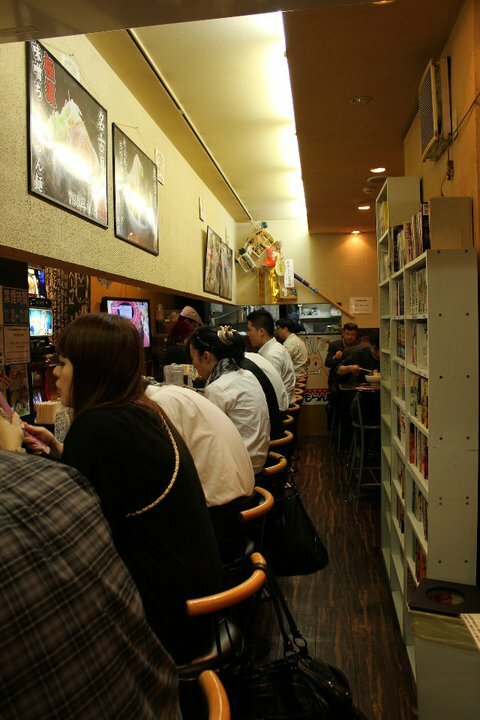 Ramen is one of the most popular dishes in Japan. It is as ubiquitous as it is varied, with each shop selling their own slightly different version of the pre-eminent dish. This particular ramen shop was quite interesting in that you walk in, choose your order at a machine, press a button which prints out a stub, and hand the stub to the server. It was all quite efficient, and the ramen was terrific. After lunch, we waited around the area for Rebecca. There was a piano store down the street from the ramen shop so we went inside and I played some songs on the various pianos to kill time. 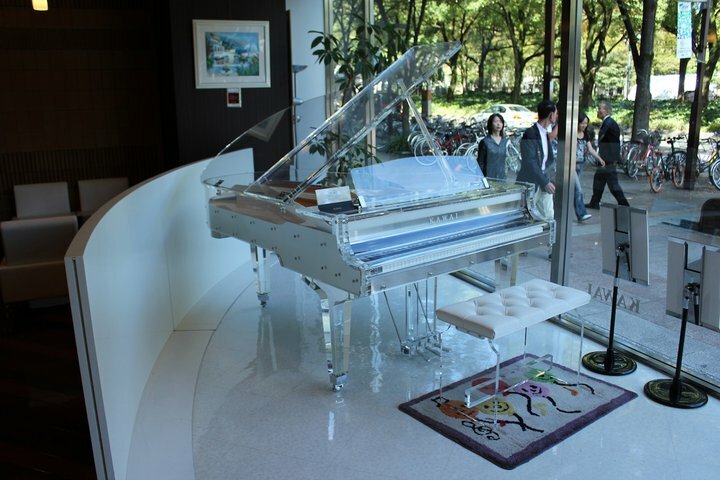 One of the coolest things I saw in Nagoya was a see-through grand piano. It cost about $85,000! Once Rebecca arrived, we hopped on the tourist bus to Nagoya castle. Nagoya Castle is a grand estate that was built at the beginning of the Edo Period for the Owari clan; one of the three famous Tokugawa family branches. 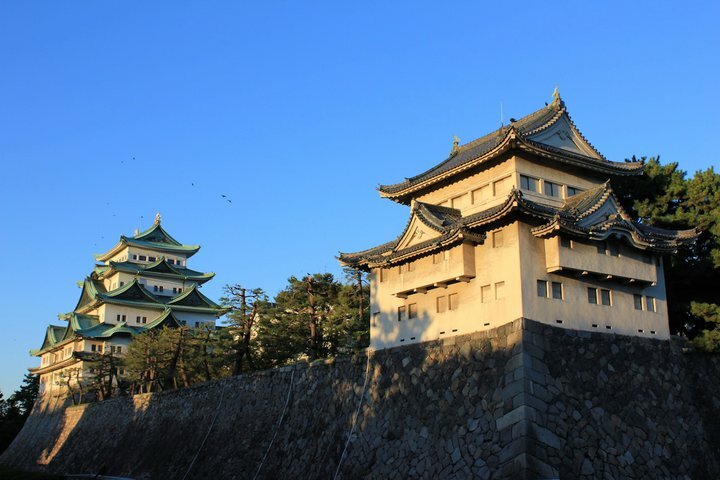 As a result, Nagoya developed into an important castle town, and eventually into Japan`s fourth largest city. Sadly in World War II, the castle was almost completely destroyed during Allied Forces air raids. It was reconstructed in 1959 with a concrete rather than wood construction. Now, The interior of the castle is a modern museum displaying the castle’s history. After visiting the castle, we returned to the city and had a nice steak dinner at a restaurant inside the underground shopping complex attached to the station. We then made our way to Nagoya Port to snap some pictures. 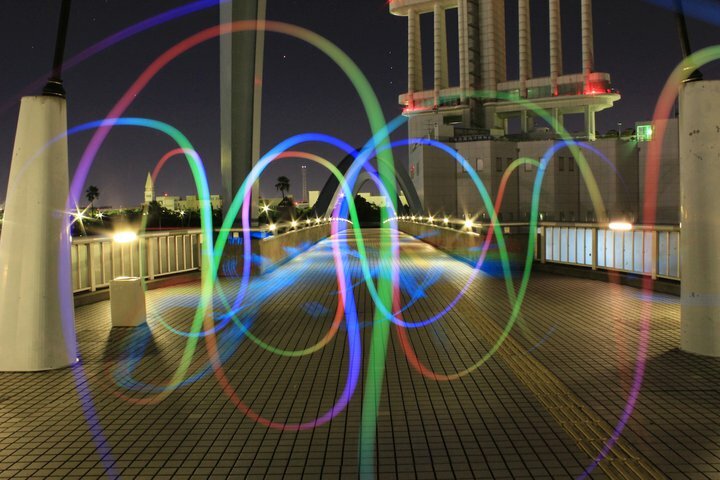 Omar taught me how to do long exposure photography, so I took a bunch of light painting pictures. Unfortunately, after making our way back to the city, we quickly discovered that finding a place to stay the night was even more impossible than the previous day. It seemed that every single place in Nagoya was booked. However after trying again and again, by random chance, we managed to find a hotel that had a single vacant room. After making our way over to the hotel, we tried to pull off the same trick that we had used the previous night. This time, as Timmy and I attempted to briskly walk by the front desk towards the elevator, we were stopped by one of the hotel employees who demanded to know where we were going. In english. Stunned and caught off-guard, I stated that we were visiting a friend. “What is their name?” Stuck in a corner I remarked, “Oh, hang on, I think this is the wrong hotel!”, and we spun around making a beeline for the door. 10 minutes later, Omar and Katy came back downstairs after dropping off their stuff and changing in the room. Our group was distraught and fret with anxiety of having no idea what to do. Katy almost walked into the path of uncomming traffic because she was lost in her thoughts. 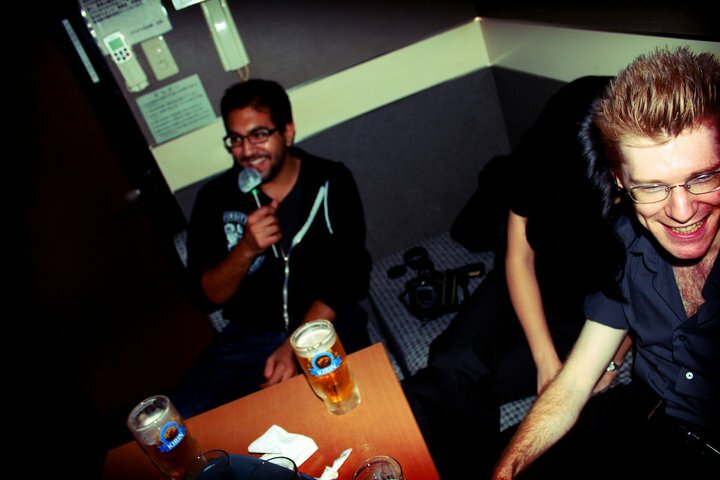 Malcolm called us up to go sing Karaoke again, so we wordleslly made our way to the Karaoke bar. A few hours and many drinks later, we were happy again, resigned to our fates and the fact that two of us would most likely be finding somewhere to camp out on the street. However as we approached the hotel at 3 in the morning, we realized that the lights to the front desk were off and that were was only one sleepy person on the late shift waiting for hotel patrons to come in. Thinking quickly, Omar carried Katy on his back while Timmy and I stumbled in with them like a drunken couple. We buzzed for the person to give us the key, and grogily and half asleep, he gave it to us. Once we got into the elevator, we celebrated like there was no tomorrow, and congratulated each other for another succesful heist. The next day, we hopped on the train for a day trip to Inuyama – literally “Dog Mountain”. Inuyama is a quaint old castle town that is home to Inuyama Castle; the oldest standing castle in Japan. It stands on a small hill next to Kiso river and offers a fantastic view of the surrounding region from its top floor. 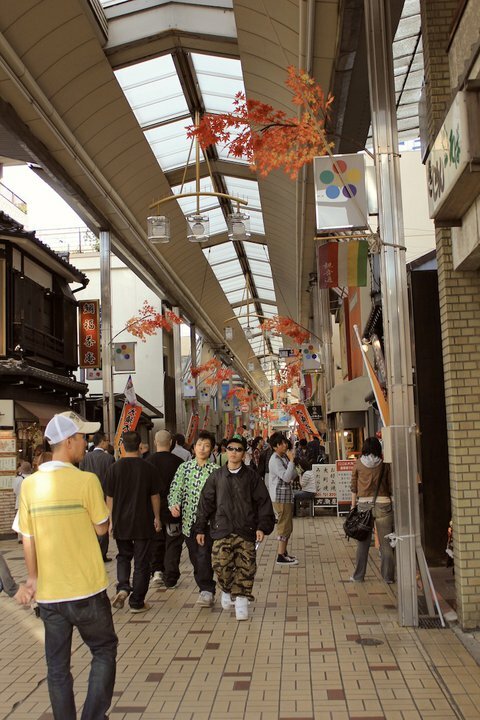 After visiting Inuyama, we made our way back to Nagoya and spent some time at a large covered shopping area. Finally it was time to make our way back to the station. We made one more stop so I could pick up a bass guitar that Macolm`s friend offered me. Yes, I randomly ended up with a bass guitar. We arrived back at the station around 7 pm and bid farewell to one another. It was quite sad seeing everyone leave, but we spent the rest of the night texting each other on our respective rides home. I had about 4 hours to kill since my bus wouldn`t leave until 11, so I walked around the station, and took some long exposure pictures of the city. At around 11:10, my bus finally pulled in so I bid adieu to Nagoya and began the long trip back home. I arrived at 6:45 and immediately got ready to go to work. It was a good trip. And that`s my 8 minute commute to work! This is me hard at work teaching. This is probably the funnest job I`ll ever hold. I love every second of it. So far, I really love working at my school. Almost all of the teachers are relatively young, and the majority of them are in their mid to late twenties or early thirties. Thus I find I can get along with them very well since the generational gap isn`t very large. There are a few teachers who are particularly memorable, and if my life was made into an anime or manga, I am sure they would play lead roles. In this post, I`ll introduce a few of them. I`ve already mentioned my Kendo JTE, but I guess I`ll talk about her a bit more. It is said that Gunma Prefecture is known for two things – strong winds and strong women. Kendo-sensei definitely falls under the classification of “strong gunma woman”. She is a very nice person, but rules her classes with an iron fist, under implicit threat of grievous bodily harm. All the ichi-nensei kids fear and respect her. I really enjoy teaching with Kendo-sensei because she doesn`t mind when I improvise games to play with the students (to reinforce a lesson) off the top of my head during class. Pooh-sensei is another of the JTE`s I teach with on a daily basis. I call her pooh-sensei because she has a lot of Winnie the pooh memorabilia strewn across her desk, and she sometimes lets me use one of her many Winnie the pooh stamps. Pooh-sensei is really tall and skinny (she kind of looks like she might break into half if she walks into something with enough momentum). She`s also a really sweet and cute person, but sometimes I run into difficulties communicating with her because her English isn`t as strong as I always think it is. The problem is, whenever I talk to her, she always just smiles really wide and nods to whatever I`m saying, regardless of if she understands me or not. I guess at this point I should only blame myself for always falling for the same cute smile and nod. There`s also Model-sensei. Model-sensei comes once a week, and I call her Model-sensei because she`s a) quite pretty and b) to everyone`s great surprise, she actually modeled for a photobook recently. What made the photobook incident particularly memorable was the publication that model-sensei decided to pose in. Now before you stick your head in the gutter, Model-sensei is a very classy young lady. She was modestly clothed in the one picture she was in, and she was talking to a beetle. Yes, there was a beetle in this picture; a huge one. 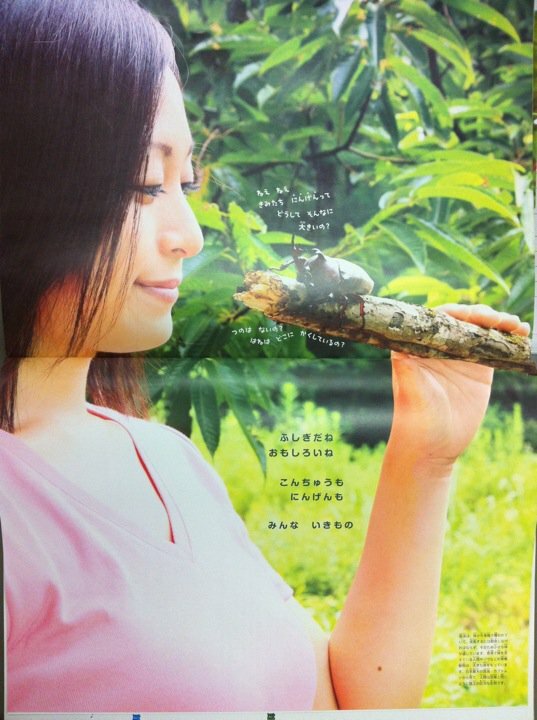 Model-sensei was posing in a big picture book of…bugs. I have no idea how she roped herself into this particular endeavor, but there she was, pretty smile and all, in front of a big gross beetle. The rest of the photobook was filled with pictures of other interesting, strange, and disgusting insects. Models and bugs. It was the weirdest book ever. The juxtapositions that Japan manages to come up with blow my mind sometimes. 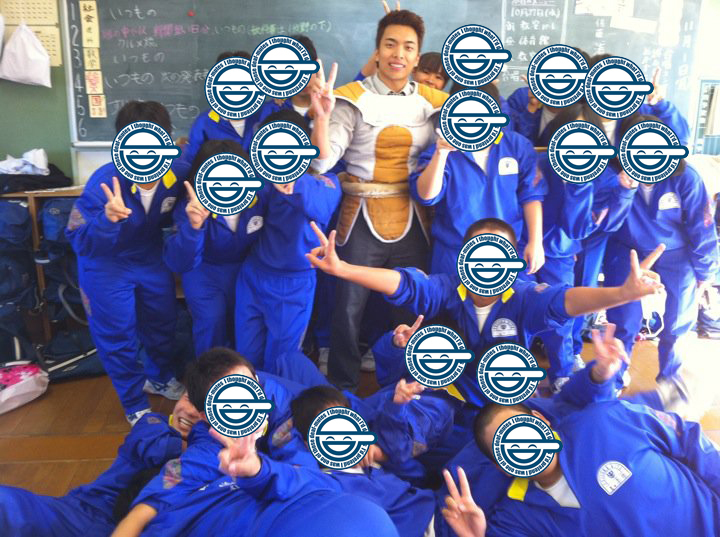 There`s Droopy PE-sensei. Droopy PE-sensei is a really tall P.E. teacher. He`s got big droopy eyes that remind me of one of the 7 dwarves, from behind his thick, rimmed glasses. For some reason, Droopy PE-sensei doesn`t have any classes at ALL this semester, so he is always either taking smoke breaks, or sitting in the teacher`s office. Sometimes we look at each other and give each other knowing nods. Because of my general lack of classes, we have lots of time to chat with each other. Unfortunately, my Japanese is as terrible as his English, so our chats boil down to lots of smiling and nodding, hoping the other party will throw in a word that we actually understand so we can make a guess about what the other person is talking about. Hmm..I should probably give Pooh-sensei more credit..
There`s Gym-shorts-sensei. Gym-shorts-sensei is another PE teacher, and he enjoys wearing ridiculously, ridiculously short gym shorts, at all time, regardless of if the weather is appropriate for it. He`s got them in several different colours, but they are all of the same questionable length. Sometimes when he`s talking to one of the other coworkers, He will prop his leg up on a nearby chair or ledge. 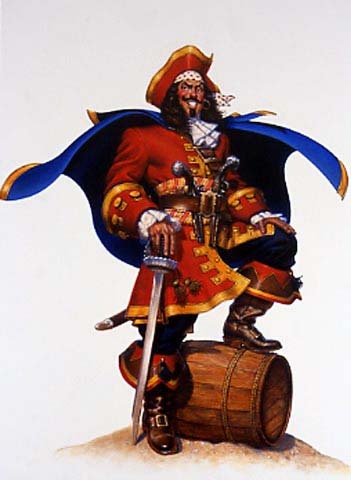 He`s also got a wicked twirly mustache. Oh my god I just realized Gym-shorts-sensei`s true identity. The other funny class is the crazy class. Now this class isn`t even one of the ACTUAL crazy ones; one of my second year classes takes the crown for that. The reason it`s called the Crazy Class is because one day, I decided to play a little prank on my JTE. At the start of every class, my JTE and I begin by greeting the students, asking them what the day, date, and weather is like, then asking how they are feeling. Usually, the reply is an unenthusiastic “so-so” or “hungry” or maybe “sleepy”. I decided to try mixing it up by teaching them “crazy”. When I explained what it means, they were initially excited. However, once the realization set in of what they were being asked to do, a heavy silence filled the classroom. I gave them a thumbs up while they all looked at each other with worry and apprehension. You see my JTE for this classroom is a national Kendo champion, and she strikes fear into the hearts of every single student. I once saw her in a duel with one of my fellow teachers. He was dressed in full Kendo body armour, while my JTE put on a…headband. The other teacher got absolutely slaughtered. The students glanced around at each other nervously. Murmurs filled the classroom and slowly got louder. Finally, the whole class gathered up the courage. I decided to ask one more time. Much laughter ensued. I was so proud of the class. 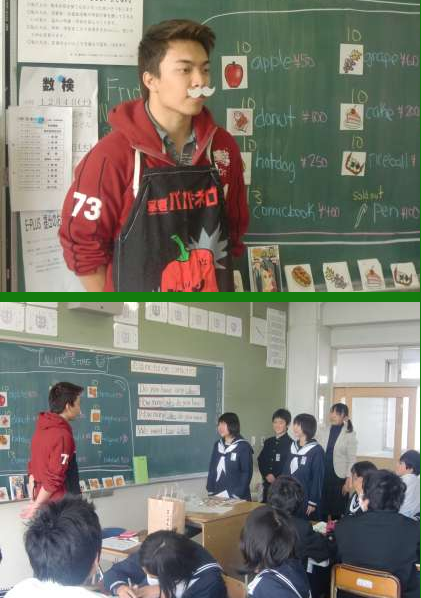 Now whenever that class begins and I ask the students how they are feeling, they all yell out “I`M CRAZY!!!! !” and proceed to burst out into laughter, as if to pat themselves on the back for coordinating such a clever joke. It`s been two months. I should probably teach them a new adjective. I have a couple of funny classes that are particularly memorable. One of them is the Elephant class and the other is the Crazy class. Let`s start with the elephant class in this post. The elephant class earned its name because one day during one of my Q&A with Apollo lessons, I mixed up one of the questions. Instead of asking “Do you come to school by bike?” I asked “ Do you come to school by…elephant?”. Once the student figured out what I was asking, the entire class blew up with laughter at the ridiculousness of such a proposition. For the return question, he asked me “ Do you like..elephant?” To which I replied “Yes I do. It`s delicious.” This resulted in a chorus of excited laughter. The students realized that every proceding question could now pertain to elephants. “Do you love elephant?” It is my favourite food, pet, and friend. “Do you eat elephant everyday?” Only for breakfast and dinner. “How many elephants do you have?” I have 6…in my stomach. “What colour is your elephant?” It`s shiny and black. “Can I have your elephant?” Okay. “Do you come to school by elephant?” Only when its raining. 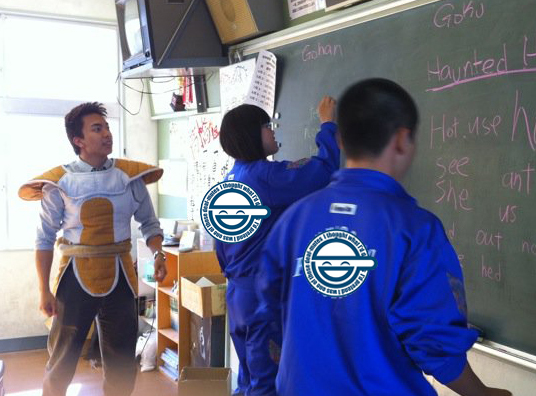 By the end of the lesson, the students still wouldn`t let it go. I occasionally still get students asking me elephant related questions. I encourage it only because it prompts my students to ask me more elephant related questions once they learn new grammar structures. Thus that class has now become the elephant class. Well the good thing is as long as you meet several basic criteria, then you definitely have a shot at participating in the JET Programme as well. If you feel that this might be something you would be interested in doing, then please read on. I will share with you my thoughts and advice on how to put together a strong application for the JET Programme. For those reading this circa November 2010, I would advise you to get on it ASAP. The application must be postdated and sent out by NOVEMBER 30, 2010. – Be a Canadian citizen (not just a permanent resident) at the time of application. From this list, one can surmise that the basic requirements are not difficult to meet. However, the programme is quite competitive and your chances of getting in are roughly 20-25%. My theory is that a large proportion of the comparatively underqualified applicants are cut at the paper application stage. Many JETs believe that if you make it to the interview, then your chances of getting in shoot up significantly (60%+ by my estimate). Thus if you are a strong candidate from the beginning, your chances of getting in are much higher than 20-25%. The reason I mention this is because the JET application process is arduously long and brutal. The application usually comes out sometime in September or October and is due at the end of November. Following that, you wait until January to find out if you got an interview, and even if you move on to the interview stage in February, you still don`t find out until mid April if you have been accepted. If you are placed on the alternate waiting list, you have to wait even longer, with no guarantee of being upgraded. It`s like being in purgatory, only worse, because you have no idea if there’s a light at the end of the tunnel. b) give the application 100% of your effort. Not 99%, not 99.99%, but 100%. That being said, It seems that the JET applicant pool is a pretty self selecting group. Although there are definitely some whackos, weirdos, and weeaboos that apply (and some who get in), most of them get filtered out in the paper application and interview stages, and for the most part the caliber of JETs (from Toronto at least) are pretty high. If at this point, you`re still here reading this, then congrats, you must consider yourself to be pretty awesome. That`s just the first step. Now we can delve into the nitty gritty of how to make your paper application as strong as possible. The paper application is really long. It`s something like 40 pages. There is a lot of stuff to complete and collect such as a self-assessment medical form and a copy of your university transcript. Its tedious but more or less straight forward. There is an important question that deserves consideration though. Question 16 asks you to list two placement requests as well as whether you want an urban/semi-urban/rural placement. Some people say that you should just put down N for No Preference. The thinking is that if you put N, it suggests you are flexible and will go wherever JET decides to send you. In my opinion, it is much better to be as specific as possible. Not only does this suggest that you actually did your homework and researched where you want to live, but it also minimizes the chance that you will be stuck all the way out in the inaka (Japanese rural countryside). Some prospective JETs rationalize that they would be happy being placed ANYWHERE in Japan, as long as they get to come here. This is foolish thinking and a dangerous gamble. You might be stuck in a tiny mountain village of 300 people, 100km in any direction from the nearest small town. So be smart, do a bit of research online and specify SOME kind of placement. Just don`t write down Tokyo; no JETs actually get placed in downtown Tokyo, and there is a slim but nevertheless none zero chance that you could get placed on a tiny island off the coast of Tokyo Bay that is technically still within Tokyo`s jurisdiction. Moving on, the application is your chance to list off your academic credentials, awards, extra-curricular activities, work experience, and international experience. It`s probably a good idea to have things to fill these sections out as thoroughly as possible. The ease by which you can fill them out will probably give you a decent indication of how competitive of an applicant you are. Contrary to what many people think, you do not need to have majored in Japanese, English, or even any “Japan” or teaching related field to get into JET. I have met people with all kinds of educational backgrounds who have gotten into JET. However come interview time, you may be asked how your field of study relates to teaching English in Japan. Don`t worry, you`ll have ample time to think of something. Your academic performance is also not as heavily weighted as you might think. The only important thing is that you have a DEGREE. I know this because my undergraduate career was filled with many ups and downs and I still managed to get here. Now onto the two most important parts of the application: References and SOP. It is absolutely crucial that you get two amazing references. This could take some time, so it is best to get it done AS SOON AS POSSIBLE. In my case, it took several months of consistently hounding one of my professors to write me what I`m sure was an amazing reference. The references are blind to you which means you will have no idea what your referee wrote. Thus it is absolutely imperative that you KNOW you`ve gotten good references. To that end, it is best to get a reference from someone who has actually gotten to know you well enough to write you a strong personal recommendation. This means that if you were just a faceless number in a class of 100 students, the reference you secure from your professor probably won`t be worth much. Once you`ve got your references, you can focus on the Statement of Purpose. This is it. This is the canvas upon which you will paint an image of yourself so captivating that the words jump off the pages and leave the reader mesmerized by your greatness. This simply needs to be no less than THE BEST essay you have ever written. If by the time you send in your SOP, there is any doubt in your mind that it is not The Greatest Thing You Have Ever Put To Written Word, then it needs another draft or rewrite. I went through about 12 drafts between 3 or 4 complete rewrites. Each time it got marginally better and better. By the end, I was confident it was the best I could do given the time constraint. Your SOP must be absolutely free from grammatical and spelling errors. On a technical level, it must be perfect. As for what to write in the essay itself – well that part is up to you. I can however offer a few bits of advice which guided my writing. – Have an overarching theme to tie your SOP together. This will make your essay stand out from the pile. I bet I was remembered as the “martial arts guy” because that was my overarching theme. – For the love of God, DO NOT talk about your love of anime, Hello Kitty and Japanese dramas. DO NOT REVEAL YOUSELF TO BE A WEEABOO. – Communicate the ways in which you ADD UNIQUE VALUE to the JET Programme. What about YOU makes you stand out as an asset towards international exchange? This is extremely important. Many people make the mistake of talking too much about why they want to come to Japan and what the experience can do for THEM. This is a value-taking mindset. You need to communicate what you yourself have to offer. Adaptable & flexible – To new situations; Managing stress; Understanding of cultural differences; Open-minded. Friendly & outgoing – Easily approachable; Willing to meet new people; Good sense of humour. Professional – Commitment to doing a good job; Working well with others; Respects work environment. 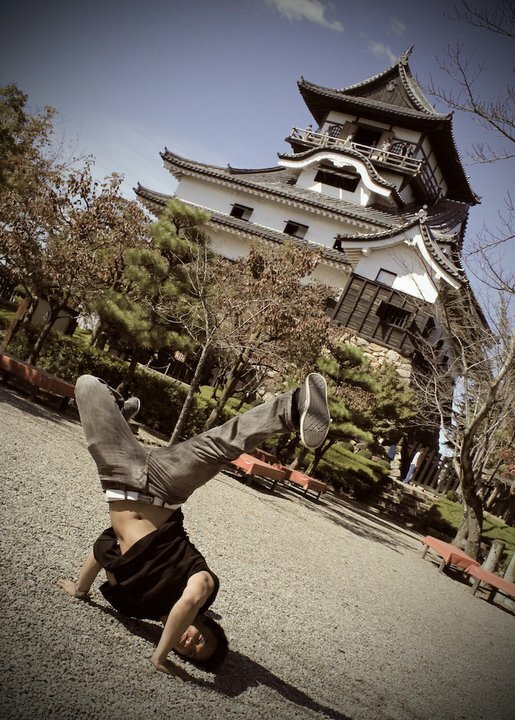 Motivated – Willing to get involved in the community; As interested in learning as in teaching; Wants to explore Japan. Eventually you`ll have everything you need. Make sure you follow directions and package everything as directed. I remember in my case, we were asked to bind everything with paperclips. If I stapled the sheets together, I bet that would have disqualified me. Do not take any chances, paying absolute attention to detail is of paramount importance. At this point you don`t want to disqualify yourself over something as stupid as a staple. Finally you`ll be able to send in your application. Make sure it`s clearly postdated before the due date at your consulate. After that, drop it off at your nearest post office and go get a drink. You earned it. Now comes the hard part – the waiting. And that about covers it for the application! Hopefully this guide gave you some things to think about, dear prospective JET. Drop me a line in the comments down below if you think I forgot something, and feel free to offer up your own ideas as well if you`re already a current JET.